A putting green and a hilly fairway at the House of Green Gables Golf Course in Prince Edward Island, Canada. 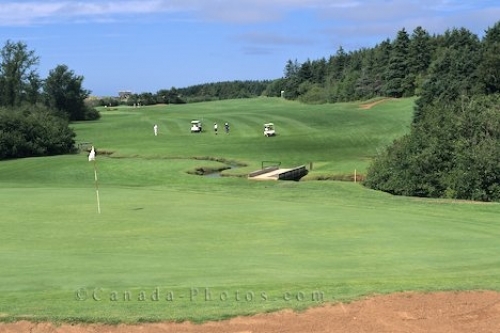 The House of Green Gables Golf Course in Prince Edward Island, Canada opened in 1939 and in the 1980's there was some major revamping done to make this golf course top of the line. Rolling hills and ocean views are part of the beauty of this eighteen hole golf course but do not expect an easy round. Rolling hills of House of Green Gables golf course, Cavendish, P.E.I. National Park, Prince Edward Island, Canada, North America. Picture of the House of Green Gables Golf Course in Prince Edward Island, Canada.